Cape Town - Stoke City came from behind to defeat struggling Swansea City 2-1 in a Premier League encounter on Saturday. Swansea came out of the blocks quickly and would hit the front in the third minute through Wilfried Bony. After Martin Olsson found space and picked out the striker, he volleyed home to score his first goal for the Welsh side since January 2015. It was a tight first -half with few chances, although Stoke were beginning to press and create problems for the visitors. After Joe Allen forced Leroy Fer into a mistake, the midfielder took possession and fed Xherdan Shaqiri in the box. The Switzerland international toe-poked beyond Lukasz Fabianski in the 36th minute to level matters. Four minutes later it was 2-1 to Mark Hughes' men as a long ball was headed on by Peter Crouch, and it fell to Mame Diouf. After a superb first touch from the Senegal star, he fired a fierce strike past Fabianski. After the interval, stunning defending by Ryan Shawcross saw the Swans denied an equaliser as Fer's cross was turned away from danger by the defender in close proximity to the goal. 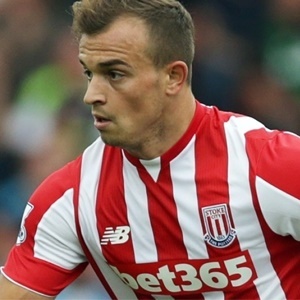 Nonetheless, in the 67th minute Diouf missed a glorious chance to make it 3-1 as he fluffed an effort from Shaqiri's cross. The away team had some half-chances to draw level but Butland made a good save from Ki Sung-yueng, before he spectacularly clawed away a header over the bar after Shawcross deflected Tom Carroll's cross on target. In the 90th minute, Ramadan Sobhi played in Shaqiri but he blazed his strike over the bar as the points went to the Potters.